Here are 2 Oak Fiddlebacks the one on the right is a Elliott Tel.Co. from Indianapolis, Ind. 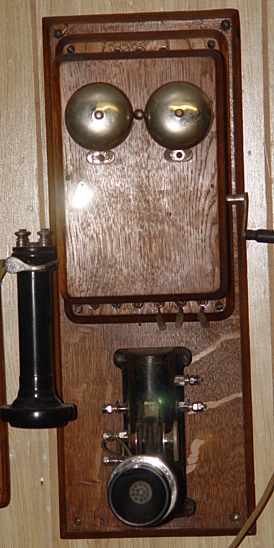 with marked transmitter faceplate. The one on the left is a Vote-Berger from Lacrosse, Wis.
Automatic Electric stair step dial candlestick with a Mercedes dial. 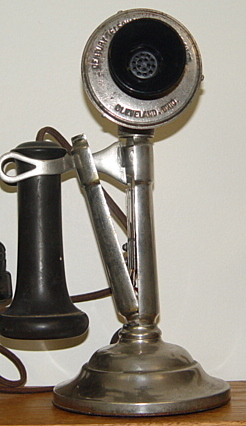 Williams Tapered Shaft Candlestick with a Milk Bottle Receiver. The Fiddleback on the left is a SERCO which is short for Sears and Roebuck Co. 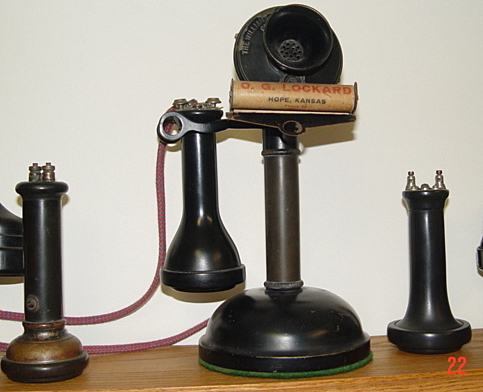 They bought phones from Chicago Telephone Supply Co. and put there name on them. The one on the right is a Central Tel. Co. from St. Louis, Mo. J.R. Holcomb & Co. String Phone. Patented in United States and Canada. 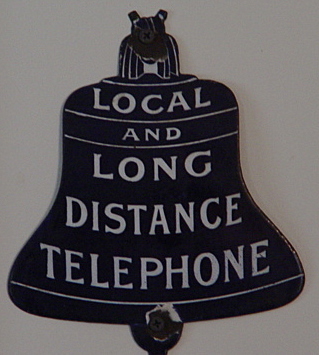 This is an early example of telephony, basically like having 2 tin cans tied together with a string and talking back an forth. 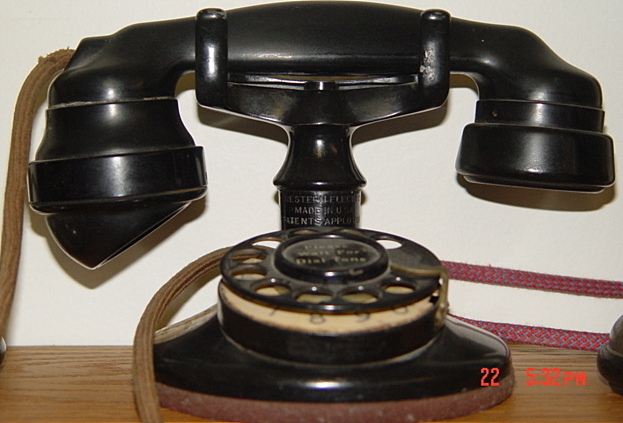 Whitman-Couch common battery phone with Long Pole Receiver. Even though this phone has a magneto with it, the batteries were located in the central office. 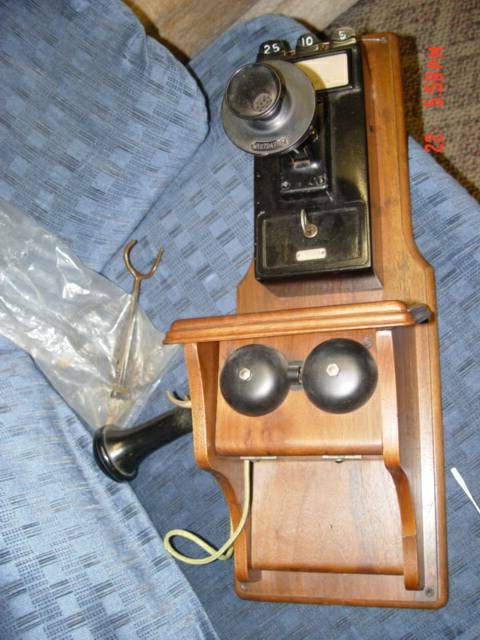 Western Electric Walnut 3-jug phone with pony ost receiver. The reason it was called a 3-jug is that it took 3 wet cell battery jars inside the battery box to give it the power it needed to operate. Small walnut Northern Elect. common battery Fiddleback. The phone didn't have a magneto in it. 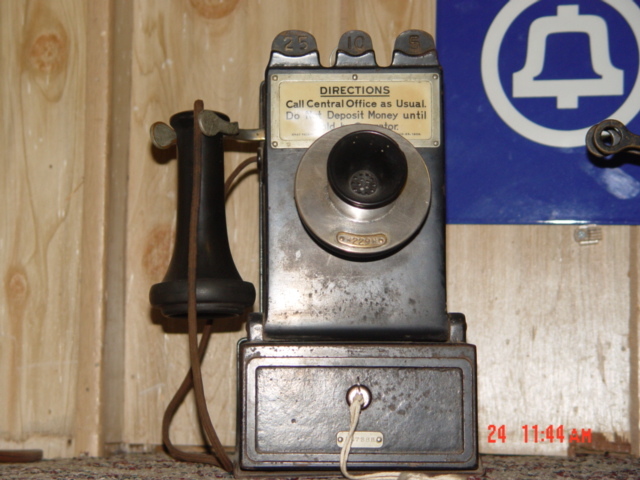 You'd pick up the receiver which would contact the operator and she or he would make the call for you. Kellogg Oak Common Battery Fiddleback with Glass mouthpiece. 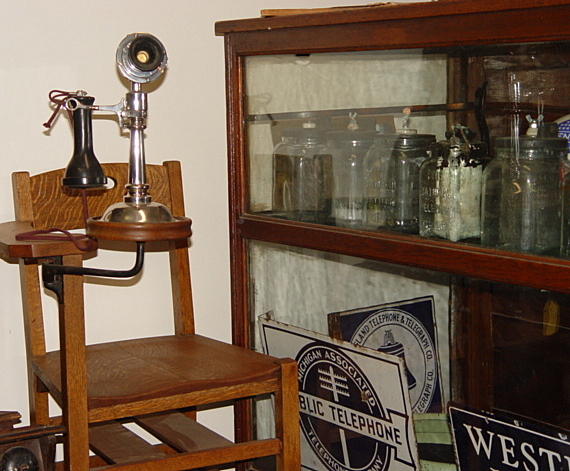 The Glass mouthpieces were used in business where only one phone was used by many empl0yees and everyone had there own mouthpiece to cut down on the spread of germs and colds. Julius-Andrea and Sons Candlestick with marked receiver, Red Cross mouthpiece and pencil holder. Again the glass mouthpiece was used to cut down the spread of germs and colds. 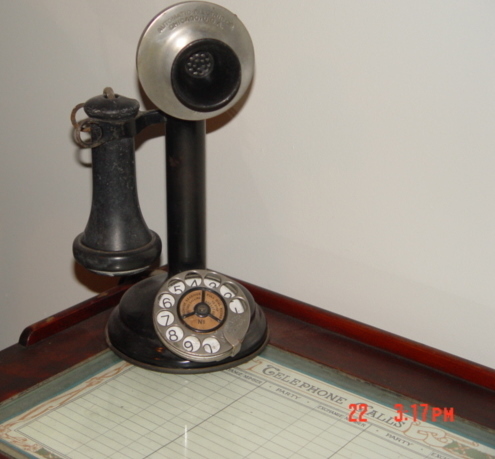 Western Electric A-1 with #2 dial and E-1 handset. 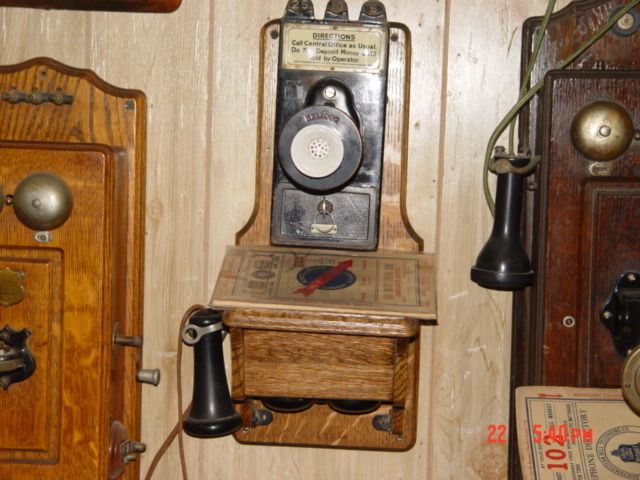 This phone has been in my family over 80 yrs. It was originally used by my great uncle who lived in Crescent, Okla.
Williams-Abbott candlestick with Milk Bottle receiver. To the left is a Swedish-American OST receiver and to the right is an unmarked Pony OST receiver. 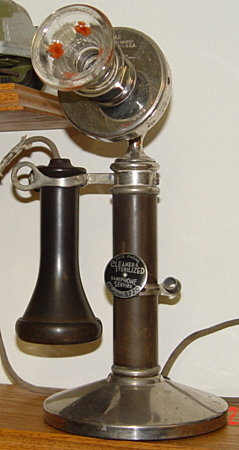 Century Split-Shaft Candlestick with marked faceplate and cup. 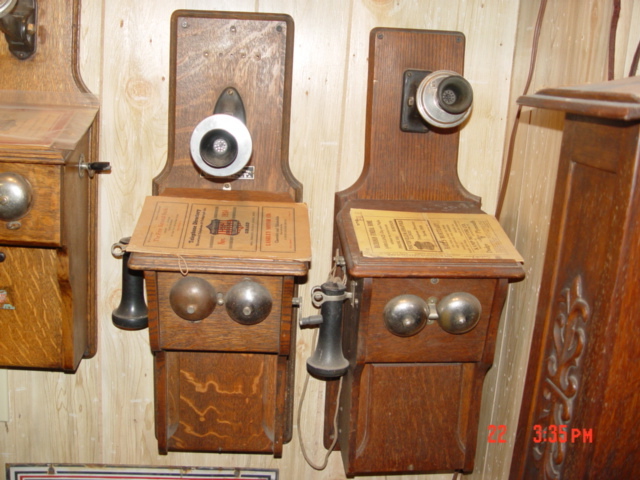 Three Williams, Williams-Abbott telephones. 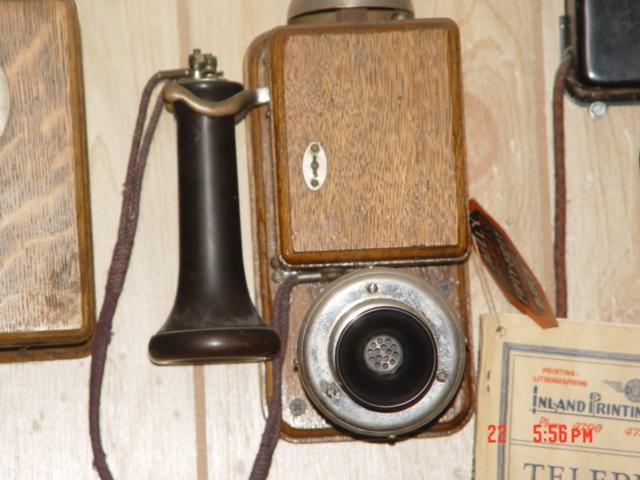 The one on the left is a 2 box phone with Milk Bottle receiver and porcelain name tag. The one in the center is a tandem with Milk Bottle Receiver, marked face plate and porcelain mouthpiece. The Porcelain mouthpieces were used the same way that the glass ones were, to cut down on germs and colds in the work place. 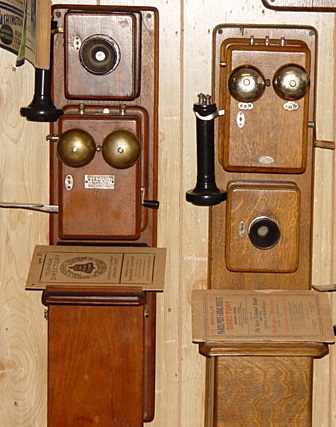 The phone on the right is a small Tandem with Milk Bottle receiver. 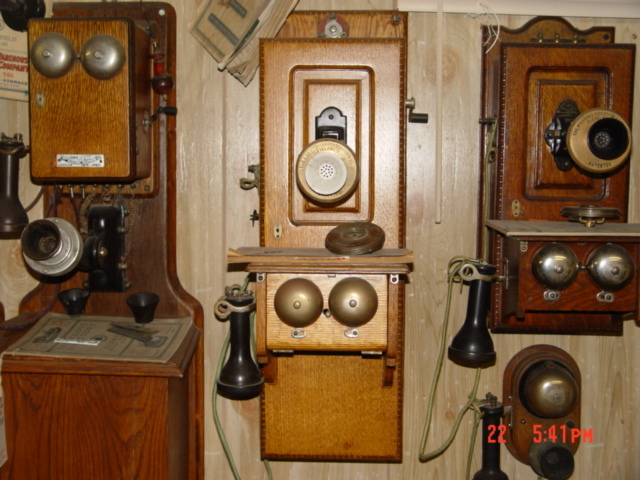 The small phone below the last phone is an intercom with Holtzer-Cabbot Ost receiver. 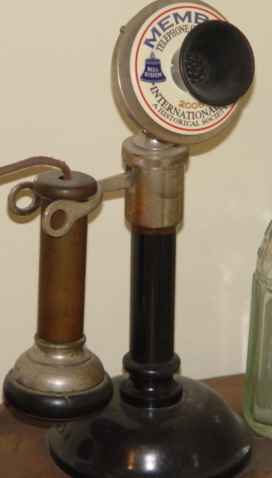 Swedish-American candlestick with marked receiver and faceplate. 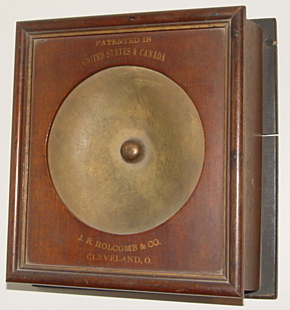 The advertising piece on the face plate was made by a club member. 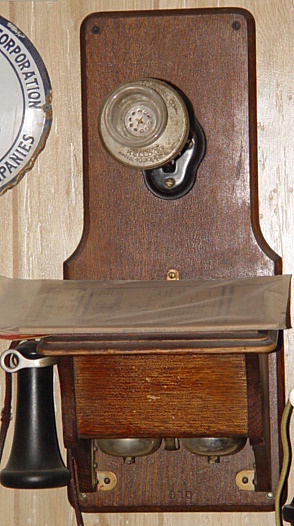 Western Electric "Doughnut" phone with pony ost receiver and phone book. 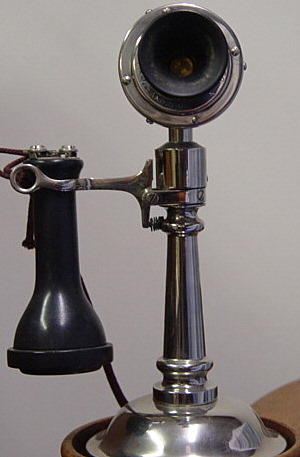 This phone was used in apt's. where space was at a premium. Western Electric walnut Fiddleback with Gray No.7 style coin collector attached. 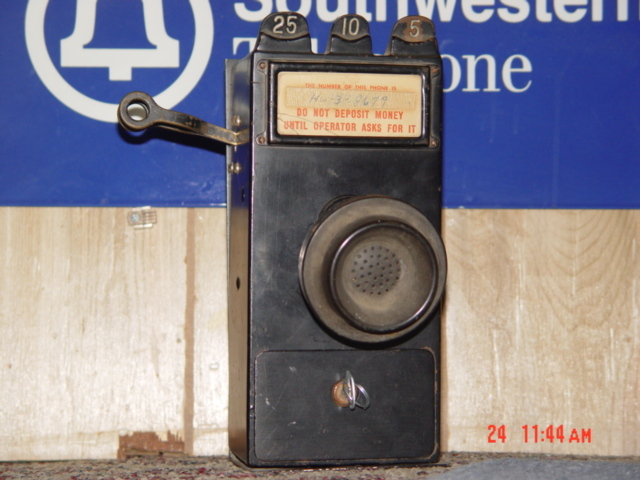 Western Electric "Queen Bee" with Pony OST receiver. 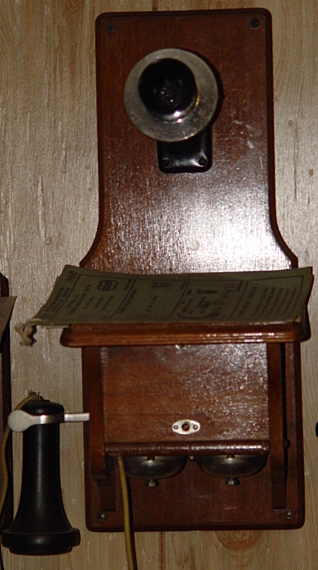 Gray 23D Pay Station with Western Electric faceplate and receiver. Gray No. 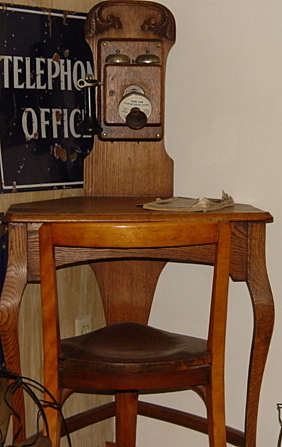 11 style Pay Station. 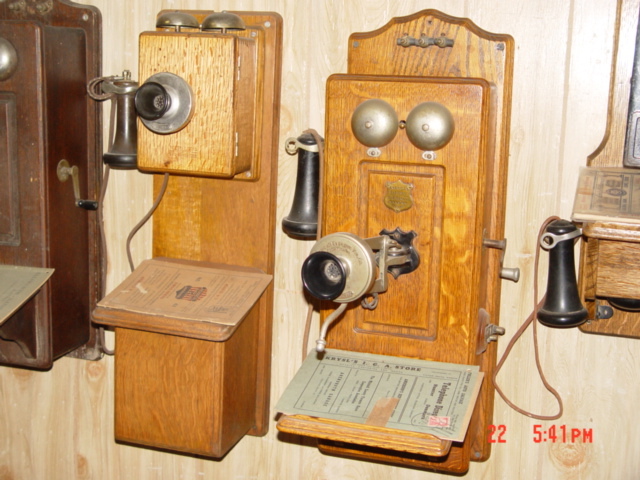 Phones right to left are American Electric Swing-Away double box phone with Burns OST receiver and Gold transmitter. 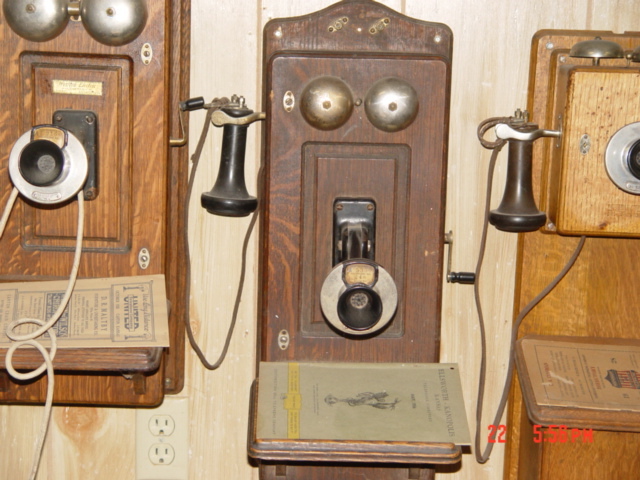 Phone in the center is a Western Electric 301 with Gray 10A Pay Station, with Glass mouthpiece and Pony receiver. 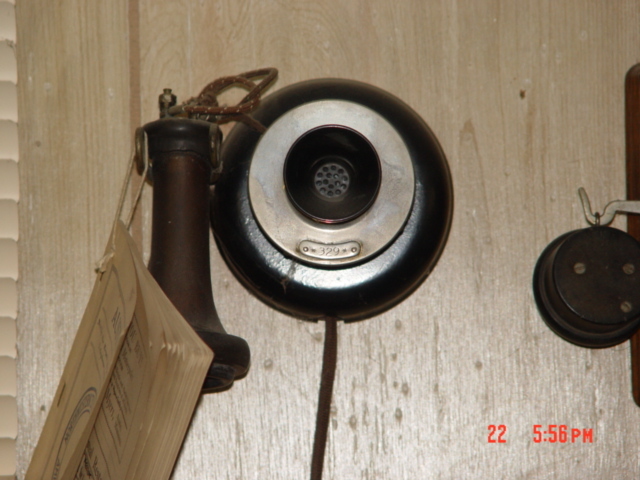 The phone on the left is a Western Electric 288 with Hush-A-Phone attachment and Pony receiver. Kellogg Common Battery Fiddleback with Gray No.7 Pay Station with Porcelain mouthpiece. 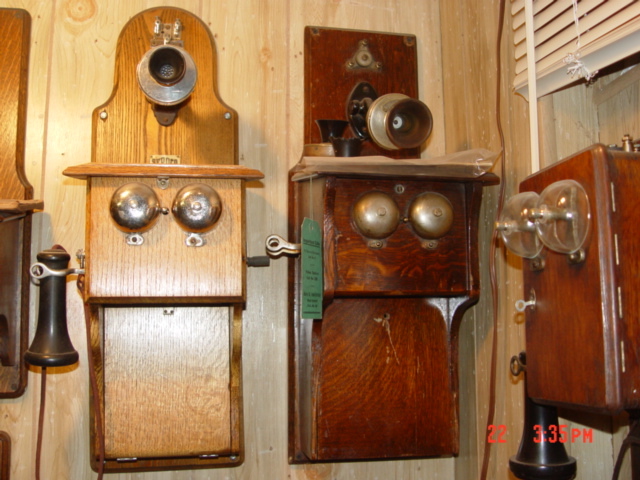 Phone on the left is a Western Electric 299 on a back board and Pony receiver. 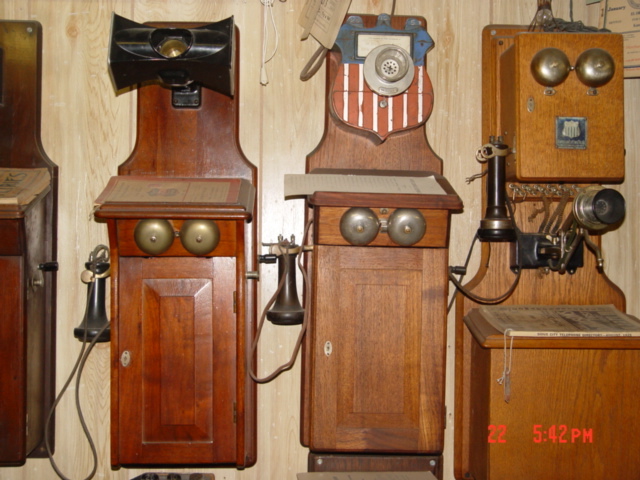 Phone on the right is an American Electric with a Swing Away Arm on it. Unusual Telephone Chair with Williams Tapered shaft Candlestick sitting it. 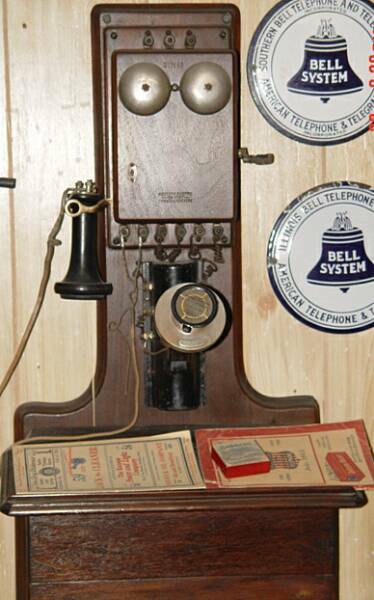 This is a Connecticut Tel. Co. Candlestick. w/ the Hershey Kiss style perch.